Mindy Jostyn: About "Blue Stories"
She's an acclaimed singer-songwriter and multi-instrumentalist, but Mindy Jostyn could just as easily be a professional storyteller. "Blue Stories" is a collection of bittersweet tales that combine pathos and humor to explore themes of love, loss, home, history, and repentance. Sam's Back With Sadie -- two women talking in a quickstop, in a small town where they've lived too long, overheard by a third woman, me. Neo-celtic. Don't Turn Away -- a ballad in the woman-who-loves-too-much vein. She tries to soothe a walking-wounded boy. Empathetic Woman -- set in a honky-tonk piano bar. It's getting late. Honky-tonk. A downtrodden man's response to a woman's complaints about her hard life. Rock City Road -- final title of the "name this song about a road" contest. (Congratulations, Herm Templeman). It turns out there's a Rock City Road in two nearby towns (to me) -- Red Hook and Woodstock, NY. There's even an antiques shop called "Rock City Relics" -- a line from the song. Can we hope that in years to come people will describe themselves with this metaphor? Asked "how are you? ", folks will reply: "I'm on Rock City Road, man" or "In a Rock City frame of mind". (Even now, if performed within 30 miles of where I live, the hook "Rock City Road" will draw a titter, two small cheers, and isolated pockets of polite applause). My excuse to play train-style harmonica a la Blind Sonny Terry. That's The Way I've Always Heard It Should Be -- a despairing view of marriage, written by the guy I'm now married to. A Carly Simon hit in 1970, it is still frequently used for the first wedding dance by misunderstanding couples. 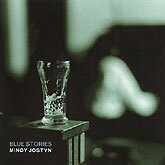 "After taking a year off to have a child, fiddler-pianist-harmonica-player-songwriter Mindy Jostyn is back with a soft thrill of a CD... Blue Stories, (Prime CD.) In a voice sparkling with wit and personality, she sings songs of loss and healing, all delivered with the eloquence that make her a favorite accompanist for Carly Simon, Billy Joel, and John Mellencamp. "On Mindy Jostyn's newly released CD, Blue Stories, her lyrics can be witty commentary, incisive self-examination and moving depictions of the simple truths in life. 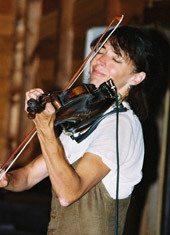 Her spiritual side comes through on the guitar ballad "Turning it Over to You", in which the clear tone of her alto rings through. 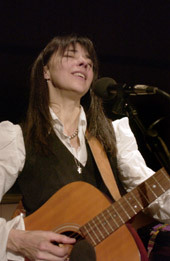 Her talking blues style is featured on "Loner" with great guitar and harmonica accompaniment. 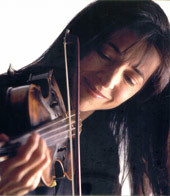 She evokes a jazz club in the wee hours with "City of Blue Stories," her view of the Big Apple.